This week my mom dropped off a bag of apples that she’d picked from the tree in their backyard. Unlike apples purchased at a store or orchard, these apples would not win any apple beauty contests. They look like a team of rejects – holes in some, dents in others, all sorts of sizes, mottled skin. But, when it comes to flavor they are exactly the way I like them – tart, a bit sweet, crunchy, and not at all mushy. They are delicious. With a big pile of these flavorful but slightly haggard looking apples on hand, I decided to make a batch of apple butter. Super ripe frozen bananas. My freezer is full of them. 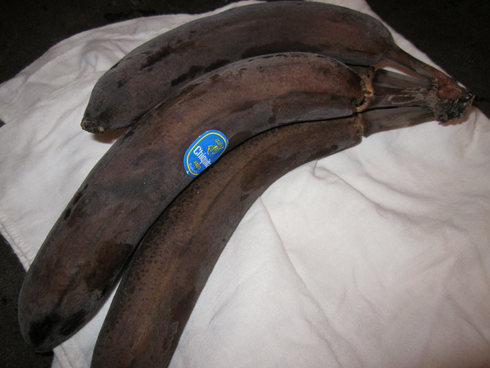 Whenever bananas reach full ripeness, no one at my house wants to eat them. I stick them in the freezer and then add them later to smoothies, banana bread, and now apple banana butter. To use the super ripe bananas, I pull them out of the freezer and set them on the counter to thaw. When they are no longer solid, I cut off one end and squeeze the banana guts out of the peel. It does not look good, but they are perfectly ripe and already smooshy, which means they are excellent for all of the uses above. If you don’t have a pile of black frozen bananas in your freezer, any ripe banana will do in this recipe. Just peel it and throw it in with the rest. Apple butter is super easy to make. The hardest part is peeling, coring and dicing some apples. In this recipe I used 4 lbs of apples, and it took me under 15 minutes to prep them. All of the ingredients are placed in a crockpot, then they cook all day. You can stir it occasionally if you’re around, but if not, it is fine just sitting and cooking on its own. Some recipes call for placing the apple butter in jars and then putting them in the freezer. I wanted to be able to give away some of these jars, so I decided to can them instead. You can place the apple banana butter in any size jar you’d like, I picked half pint. The one on the left requires a rugged good-natured fiddle player named Pa and a handsome husband named Manly. For this recipe, you’ll need the one on the right, and you’ll need about eight of them. Place all the ingredients in a crock pot and turn to low. Cook for 10-11 hours. Stir occasionally if you’re available. You’ll know the recipe is done when everything is mushy and has turned a warm brown-red color. Fill canning pot with water and bring to a boil. 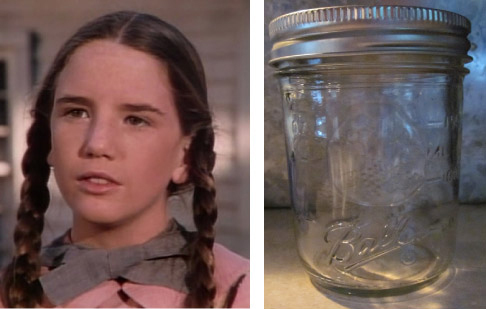 In a large bowl filled with very hot water, place jars and lids. Remove hot jar, wipe dry and fill with apple banana butter leaving about ½” empty at the top. Place lid on top and secure very tightly with band. Repeat with remaining jars. Place in canning pot and be sure that they are all completely covered in water. Cover and cook for 10 minutes. 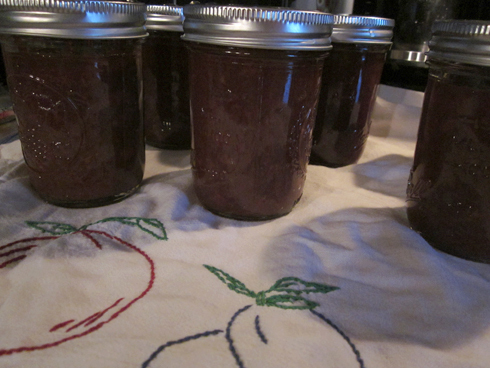 Remove jars from canning pot and set aside to cool. – A little apple banana butter goes a long way. A single serving is enough for a thin layer on two pieces of toast, or a nice thick dollop on top of an english muffin. 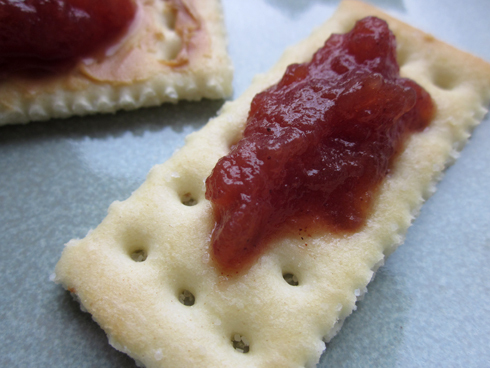 – Great on all kinds of breads or crackers, especially tasty with peanut butter. – Try it with pork chops or tenderloin, it lends some tasty sweetness. – Some people add this to banana bread or muffins, which I bet would be good, but I have not tried it. this sounds AMAZING!!!! but i’m not a ‘canner’ could i still fill the jars and give them away without the canning step or is that necessary? An open jar should keep for awhile in the refrigerator, much like jelly. If you’re going to have some extras around, you could try storing them in the freezer. Let me know if you try it and what you think! Hey, Jennie: Thanks for this recipe. It’s the simplest recipe on the net. The others are left in the dust. This sounds very good and I will warm up the house today by slow cooking it.